The number of houses placed on the auction block by banks has increased by nearly five-fold as borrowers struggle to sell their luxury units amid the falling prices and the government’s tough cooling measures, according to media reports. Between January and October of this year, 98 repossessed homes were placed under the auctioneer’s gavel, said Colliers International, a far cry from the 17 for the whole of 2013. 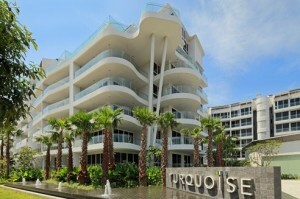 These include non-landed properties at renowned residential projects such as Turquoise at Sentosa Cove (pictured), Reflections on Keppel Bay and Stevens Court at Stevens Road. “Amid the stricter regulatory and financing environment, borrowers in default are finding it difficult to sell their properties on their own, as buyers generally remain cautious,” added Colliers International’s Deputy Managing Director Grace Ng. Additionally, due to defaults by high-end property owners, non-performing loans (NPL) of local banks have also substantially increased. According to United Overseas Bank (UOB), its housing NPLs nearly doubled to $502 million in the third financial quarter from $295 million a year ago. The significant gain is mainly attributed to borrowers who invested in a specific luxury project in Singapore, but the lender declined to reveal its name. At the same time, Overseas Chinese Banking Corporation’s (OCBC) NPLs rose to $272 million from $227 million. One factor behind the increase is the consolidation of OCBC Wing Hang’s portfolio. “If you have maxed out your loan quantum and values have dropped, you will have difficulty refinancing, especially if your credit worthiness is not attractive. There’s a possibility that banks may ask you to pump in more money to top up your value. When someone is not able to do so, that may go into the NPLs,” added Chestertons Singapore’s Managing Director Donald Han. This entry was posted in Loan / Mortgage / Finance and tagged Auction, Financing, homeowners default payments, Housing Loan, Mortgagee Sale, non-performing loans, NPL, Reflections on Keppel Bay, Stevens Court, Turquoise at Sentosa Cove. Bookmark the permalink.